Males of many species engage in fierce competition for mates. That competition can take the form of intense battles with rivals or flashy displays that attract females, but in just a few species, males do something truly unusual: instead of competing, they cooperate. Male lance-tailed manakins form long-terms two-male partnerships and display together for females, but only dominant “alpha” males mate with the females a pair attracts. It has long been assumed that cues from the dynamic multi-male displays are a key part of mate choice, but we’ve found that displays are more likely to end with a copulation when males don’t have their display partner around. Why do males cooperate, and what are females looking for, anyway? Drawing on 20 years of empirical research into lance-tailed manakin cooperation and mate choice, she will explore the astounding behaviors that have resulted from intense sexual selection while questioning long-held assumptions about how sexual selection works. Emily DuVal earned her B.A. in Biology and Sociology at Rice University, and first became involved in ornithological research as a freshman collecting data on great-tailed grackle mating systems (a project that she took part in for all four of her undergraduate years). 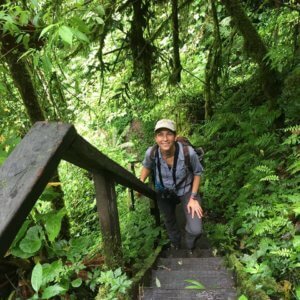 Following graduation, she traveled as a Thomas J. Watson fellow to study conflicts between conservation and cultural traditions in Guyana, Australia, and New Zealand, and she started studying lance-tailed manakins in her first year of her PhD at the University of California, Berkeley, where she was supervised by mammologist Eileen Lacey. She did a postdoc with Bart Kempenaers at the Max Planck Institute for Ornithology in Seewiesen, Germany, and in 2008 she moved to a faculty position at Florida State University where she is now and associate professor.